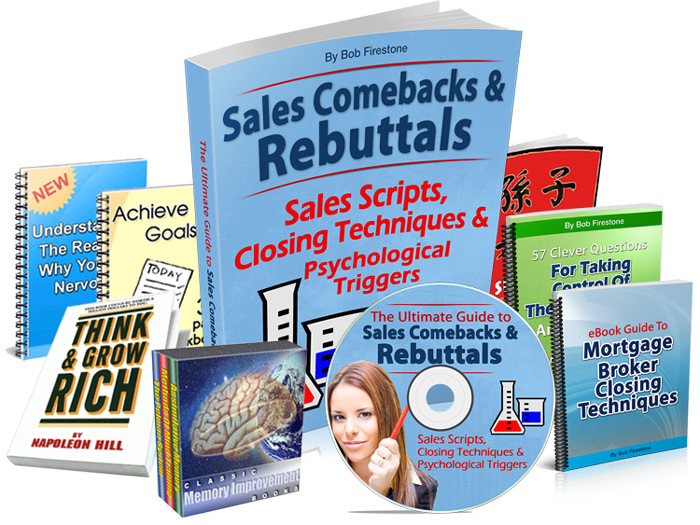 〉 Download 250 Word-for-Word Sales Rebuttals + MP3 Audio Sales Training. T his audio is just a small taste of the hundreds of sales rebuttals, comebacks, turnarounds, tie-downs, probes, clinchers, and closing techniques I want to give you to use on your customers. Use my sales phrases to close more deals & make more sales. You're smart enough to have found this page. Obviously you want to increase your sales ... but how? Answer: Highly effective rebuttals for overcoming objections. Try these sales scripts ... The reason is because you have LIMITED TIME in front of your prospects to deliver your sales message. With that time you must say the most powerful things that are most calculated and most likely to get your desired business result. And here they are for you, on silver platter. I've been continually improving this collection since 2004. These fresh and modern Comebacks and Rebuttals are BETTER and DIFFERENT than the standard stuff that has been around for years. You're learning new and original TRUST-BUILDING, FAITH-GENERATING conversational comebacks designed for today's informed clients and complex business world. 〉 Continue reading to see the example sales techniques! No need, no money, no hurry, no desire, or no trust. … You must overcome these objections on every sale. Frustrated by their stalls? … Sick of rejection? I'm too busy right now. It's not a priority. Just email me some info and I'll keep it on file. The price is too high / We don't have the budget. I need to wait / I need to think about it. Call me in six months. I need to talk to my VP, partner, boss, wife, etc. We're currently using another supplier and we're happy. It won't work for us. We don't need it. We've had a bad experience with this type of thing. You're too small / never heard of you. I like the idea, but I need you to tell me I'm making the right decision. "... a full explanation of what you need to say to close the sale." "Let me ask you this, Jim — Now that you know everything there is to know about this, WHAT'S THE ABSOLUTE WORST THING THAT COULD HAPPEN if you went ahead with it today?" "I know you like the idea, but WHAT IS THE REAL REASON you won't try this right now? ... The monthly investment you make is less than what you might spend on a couple rounds of cocktails on a Saturday night! — plus we have a money back guarantee ... "
"I know you're busy, and so am I — but just take two minutes to get the info and then YOU BE THE JUDGE ... I mean if you saw a hundred dollar bill sitting on the sidewalk, you'd take a second to stop and pick it up, wouldn't you? ... I know that's a cheesy example, but I just want to introduce myself and LET YOU KNOW THAT WE'VE HAD A LOT OF SUCCESS in helping business owners just like yourself ... Hear me out for a second, OK?" "OK, but hold on a second, Sarah — I want to ask you: If there is anything about our company, service, or price that you don't like, then I'D LIKE YOU TO TELL ME, because the last thing I want to do is annoy you about something you aren't interested in. WOULD YOU DO THAT? Fine. So by the time we've had a 2 minute discussion, we'll either be doing business or we won't. Fair enough?" "Margaret, there are usually three reasons why someone can't make a decision when we first contact them. The first reason is that they don't quite understand how it works and how it will benefit them. The second reason is that I might not have built enough credibility in my company ... and the third reason is that they simply can't afford us. IF I COULD SHOW YOU WITHOUT A DOUBT THAT IT DEFINITELY WORKS, then what exactly would be holding you back?" "Which company are you using? Oh, that's a good company!! Who are you working with over there?? ... Hmm, I haven't heard of him. How did you happen to choose him? I see ... Why do you think you should stay with them WITHOUT COMPARING WHAT WE HAVE TO OFFER? — Seems like you're taking a big risk by failing to compare value"
"Look, I'm not asking you to give me one penny from your budget, I'm asking you to invest in your business — and finish what you started. You're the kind of person that likes to finish what you start, right? ... You've already invested time and money building a business with a great product, but you won't make the money you deserve unless you add a catalyst. What I'm showing you today could be EXACTLY THE CATALYST you need ... Listen to this story about our client XYZ ..."
"Right. The question of price is an important one. I'm glad you brought that up and you'll be happy to know we've thought a lot about it. SURE, There is a minimal amount that you need to invest in order to get going, BUT THE BEAUTY IS you'll have it right away — and you'll have solid concrete proof that it's a good product. You would agree with me that if this thing could almost double your income then IT WOULD BE WORTH TAKING A NO-RISK TEST DRIVE, WOULDN'T IT?" "EVERYONE HAS BEEN REALLY EXCITED ABOUT THIS MORTGAGE PRODUCT, and I can tell you that it's really not about cost ... IT'S ABOUT INVESTMENT. For instance, you buy six thousand dollars worth of stock so you can sell it for twelve thousand a couple months later, right? ... That initial $6k is not a "cost," IT'S AN INVESTMENT — the smart investor knows this. Jim, I want to PROVE to you that what we do is a LOW RISK way you can leverage a MINIMAL CASH EXPENDITURE to earn a maximum return on your money. You want to increase your income, don't you? ... I know! Who doesn't! ... Right?" "I can appreciate that. All of our current clients know that PRICE IS REALLY THE BEST PART about partnering with us. We can do small installment payments so your actual investment per month will probably be much lower than what you spend on your cell phone bill! If price was not an issue, WOULD THERE BE ANYTHING ELSE HOLDING YOU BACK from giving this a shot today?" "I appreciate your need to wait and talk it over, and HERE IS WHAT I CAN DO. I can hold this discount for you if you put a good-faith deposit down and let me know your decision within 24 HOURS. I am sure your partner / boss / wife is not going to want to miss out on this — and I'm sure that if he were in your shoes — YOU WOULDN'T WANT HIM TO PASS UP THIS OPPORTUNITY EITHER ... Throw down a 10% deposit and we'll reserve this special pricing for you, OK?" "I can definitely understand that, Mr. Prospect. You're right. This is a business decision and you need to make sure that it's cost-justified ... Look, — I have a lot of experience HELPING BUSINESSES JUST LIKE YOURS to analyze "COSTS VS. PAYBACKS" — I talk to people in your position ALL DAY LONG, EVERY DAY and I hear the same intelligent concerns that you are voicing right now about RETURN ON INVESTMENT ... I would be happy to HELP YOU WITH YOUR ANALYSIS ... OK? ... Look, if I can show you without a doubt how our clients regularly make a 347% ROI from this, then WILL YOU MAKE A COMMITMENT to seriously consider what I am proposing here?" "I know that maybe that's not 100% resolved in your mind yet, but FOR NOW — just assume that it is ... Let's take it off the table. Just assume that we've solved it. With that out of the way, Let's just try this ... Let's just try it right now, OK?" Plus 25 proven closing techniques, and something like 80+ turnarounds, clinchers, and probe questions. With the right rebuttals you will find that the big man is easier to talk to than the little man; It's easier to get a big order than a little one. YOUR WORK WILL BE EASIER and by far more pleasant than it ever was before. Think of learning these new techniques as a gateway to increasing your own personal revenue. Is your family depending on your ability to SELL? No matter what you're selling, you will benefit from this training. Increase your confidence & ability to transform your sales. Smash through their objections and break your personal sales records. Eliminate any fear or call reluctance that's holding you back. Propel yourself to new levels of income and earning power. Think of how you'll feel when you start closing more deals! Start your next sales day with more hope … and better possibilities. Instantly download and hear this massive collection of 100% original, fresh & modern rebuttals and closing techniques. Listen, pause & rewind until you've mastered them. Teaches you quickly and easily. Add it to your iPod or phone, play it in your car. Fills you with motivation and confidence. Download it now. Return it if you don't like it. Try it with no risk! … Easy automatic instant refund if you’re not 100% satisfied. 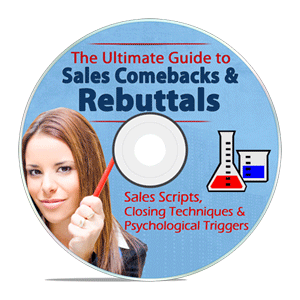 The Ultimate Guide To Sales Comebacks And Rebuttals 2016! 85 page Guide contains 250 Word-for-Word Rebuttals, plus dozens of proven Opening Scripts & Closing Techniques. Use this Guide to build and reinforce your attitude of confidently EXPECTING to succeed. Visualize the close! If you are serious about making more money in sales then you owe it to yourself to download this lethal arsenal. Get 25 modern closing techniques plus 17 CLOSING POWER STATEMENTS that ask for the sale.
" ... Why don't you take it?" " ... May I ask for your order today?" "Jim, if we could get the paperwork out of the way right now, then that would be JUST ONE LESS THING IN YOUR WAY before you start enjoying the benefits. If my assistant faxes something over right now, CAN IT GET AN 'OK' BY THE END OF THE DAY?" "... THAT WOULDN'T STOP YOU FROM TRYING THIS, WOULD IT?" "SO HERE'S WHAT WE NEED TO DO. The $4,500 package includes (detailed list of benefits) ... THAT'S EVERYTHING, RIGHT? ... Are these the ones you want? Fantastic. My assistant is going to go ahead and fax over a simple agreement that will need an approval. WILL IT GET FAXED BACK TO US BY THE END OF THE DAY?" "Nice. I like it. I'm with you. OK, I WOULD LIKE TO MAKE A RECOMMENDATION based on what you have told me. I think you should go with the intermediate package that you agreed would probably be a smart thing for you to do. We use a simple agreement that will need your initials after my assistant faxes it over in the next ten minutes. THAT's ALL WE NEED TO DO to get my guys started on this for you ... "
"... if we could do that for you, THEN WOULD YOU SERIOUSLY CONSIDER GIVING IT SHOT? ..."
"Can you see how this is a really low-risk way to totally rule out failure and it's the best option to go with your strategy? Let's give it a shot, OK?" "Don't you deserve this advantage? — pick it up right now. And the price is very fair considering other the stuff on the market and THE HUGE ADVANTAGE it gives you once you start using it." The Guide gives you about 50 different ways to close the sale — including 25 "new school" closing techniques. The "good cop, bad cop" close. The "I noticed a strange thing on LinkedIn™" close. The "sorry on the way out" close. The "tell a winner / loser story" close. The "because you're serious" turnaround close. A new school technology-based twist on "the balance sheet" close. Plus at least 40 more word-for-word closing techniques that will stun you in their effectiveness to get your prospects to buy! So, what exactly's in this Master File? … What's it look like? IT'S LIKE HAVING a top-gun sales guy looking over your shoulder, guiding you through the sale. — You'll have all the potent tools close at hand. 85 pages — over 17,000 words — of actionable money-making sales scripts painstakingly edited and assembled into an easy-to-use Guide. Professional Mp3 Audio so you can listen and learn on your phone or in your car. 17 word-for-word closing "Power Statements." 25 astounding new-school closing techniques that ask for the sale. 6 budget data-mining questions for you to sniff out the money. 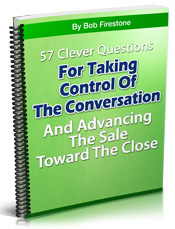 38 selling questions for you to isolate the objection. Seven (7) Cold Call OPENER Scripts to set appointments with Small Business Owners, or Senior Executive Decision Makers. How to turn Gatekeepers into Guides: 10 techniques to get past the receptionist and make their assistant work for YOU. A virtually unknown process to jump start word-of-mouth and obtain referrals, references and repeat business. Opens your earning potential to a new world of opportunity! 5.0 out of 5 starsThis guide has now become our "Bible." "Bob, the info you offer is AWESOME. it has helped us a lot already after having it just a couple days. I am a manager of a telesales office and we have three branches. We had a management meeting yesterday and this guide has now become our supervisor's "Bible" for training out TSRs." 5.0 out of 5 starsWe've almost doubled our closing ratio. "Dear Bob, Love the book. I am the Managing Principal of a securities broker / dealer and Registered Investment Advisor in Oakland, CA. I made your audio training and book required reading for our sales staff and we've almost doubled our closing ratio in 60 days." 5.0 out of 5 starsWill put you in total control of your appointments! "Sales guru Bob Firestone is a genius when it comes to awesome comebacks for overcoming objections. This fantastic training package is packed full of great comebacks and sales rebuttals that will put you in total control of your appointments, and have you closing a lot more sales, fast!" 5.0 out of 5 starsBlown away by the quality of the content. "Over the years I have read a lot of books on sales. Most just rehash old material and offer little if anything really new and innovative, so when I saw your Sales Rebuttal Guide advertised I was dubious. I wasn't really expecting as much as was promised on the website. But you not only delivered, you over-delivered and I was blown away by the quality of the content." "Bob ... Absolutely use my testimonial! I purchased your Sales Guide. We opened a contract call center in Northeast Ohio that houses 75 sales and fundraising reps. I've been in telesales for a long time but even for an oldtimer like me it's been highly profitable to learn new and different ways of getting past objections and getting our prospects to buy." 5.0 out of 5 starsI've seen substantial improvement within myself and my reps.
"If you're looking to increase lead conversion rates and bring home more money, then this thing is a must have. I manage a team of 10 sales reps and with your materials we have saved countless accounts. I've seen substantial improvement within myself and my reps across the board. No matter where you are in your career you can always improve in the art of negotiations. I highly recommend this to anyone." 5.0 out of 5 starsAmazing … I listen while I'm driving. "I recently purchased your training for my direct sales MLM business and I must say it's amazing. I downloaded everything to my iPad and I also listen while I'm driving in my car. Your techniques have made selling so much easier for me. If anyone out there wants to increase their sales don't let this product pass you by." 5.0 out of 5 starsNew and different. Highly recommended. "I do at least 2 hours of cold-calling per day, and this is exactly what I was looking for!! The rebuttals are definitely new and different from what I have seen before. Also, it's all there in black and white right in front of me and I don't have to flip through a bunch of garbage like I do with the sales books I got off Amazon. Great resource. Highly recommended." 5.0 out of 5 starsOne of the best I've read this year. "Bob, I've read all of the popular sales books and most of them can't touch your book. The audio training is fantastic. I rank your book as one of the best I've read this year." You get an Eighty-Five Page Guide (over 17,000 words) that includes over 250 intelligent and effective Comebacks and Rebuttals • 17 word-for-word Closing Power Statements • 25 "new school" Closing Techniques • 38 selling questions that isolate the objection • 6 budget data-mining questions • 7 Cold Call OPENER Scripts to set appointments with Senior Executives • 10 tips to turn gatekeepers into guides (make their assistant work for you) and a special section on Psychological Triggers that play on FEELINGS and EMOTION. And you get The Mp3 Audio Training (over 1.5 hours) so you can listen and learn and hear everything & decide for yourself which rebuttals are the best fit for your product and your personality! No, There are also seven (7) bonus items included when you try the Guide. Plus 2 useful "surprise" bonuses I've added as of . 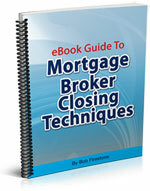 ➊ "eBook Guide To Mortgage Broker Closing Techniques" — I wrote this in '05 while working intimately as a Marketing Consultant for "The Loan Broker Academy" in San Jose, CA. They told me to get DOWN & DIRTY with these closing techniques. They work for Real Estate sales, too — for Listing Agents, or for when you represent the Buyer ... A $29.95 value. 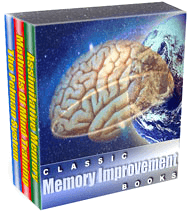 ➋ "Classic Memory Improvement Techniques" — 3 of the best memory-sharpening books condensed into 1 extra-strength .pdf Guide (over 81 total pages). Learn the "Flash Memorization" technique, plus every other memory trick you could possibly know. Never forget the names of your clients. Create mental running lists of hundreds of "to do" items. You will remember everything you read, hear, or need to do — like paying bills, picking up your dry cleaning, etc ... A $14.95 value. 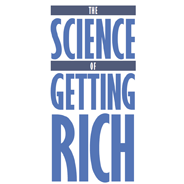 ➌ "The Science of Getting Rich" — Concentrated and presented in a beautifully simple way, this book will inspire you to create the life you want. It's said that there is an exact science to growing your income — and once these laws are are learned and obeyed, it's possible to get rich with mathematical certainty. Guides you to develop a vision, strengthen your willpower, and cultivate an empathy & likability that's crucial in person-to-person selling ... A $14.95 value. ➍ "57 Clever Questions For TAKING CONTROL Of The Conversation And Advancing The Sale Toward The Close" — I wrote this 14 page resource for my sales guys who tend to get "side-tracked" on sales calls. Use these strategic questions to bring the focus of the sales conversation back to YOUR goals. Any time you feel that the conversation has gone down the "wrong path," try one of these questions to sniff out buyer preferences and get back to advancing the sale toward the close ... A $19.95 value. ➎ "Understanding The Reasons Why You Get Nervous" — Sweating. Butterflies. Tight throat. These are uncomfortable symptoms at a time when confidence is crucial. Learn how to control them when you need to have difficult conversations, or a big meeting with powerful people. This Report teaches you why you get nervous, and offers: "A Quick And Simple 9-Step Exercise You Can Do That Will Calm Your Nerves Every Time." ... A $14.95 value. 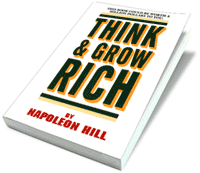 ➏ Napoleon Hill's classic "Think & Grow Rich" — This 175 page masterpiece is the definitive manual to programming your mind to take specific, step-by-step actions that will make you wealthy. This best-seller has sold millions of copies and has been translated into 26 different languages. It's yours when you order now. 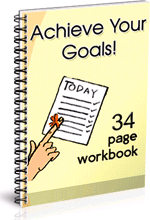 ➐ "How To Achieve Your Goals In Sales 34 Page Workbook" — This is an essential goal planning tool! ... I personally recommend that EVERYONE use this workbook, for increasing your sales and improving your life in general. The easy "fill in the blanks" format will guide you step-by-step in determining what you really want out of your career & life, and how to avoid stupid mistakes & self-sabotage that lead to failure ... A $14.95 value. 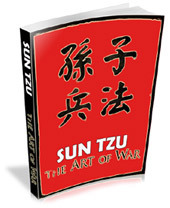 ➑ "The Art of War" — If you've never read it, get it here now. Free. When you're in the trenches, The Art of War gives you the strategy and tactics to pick your battles and win the sale. Timeless wisdom to out-think your prospects and out-sell your competition ... A $14.95 value. * All of these bonus items are available instantly from your private download page immediately after you want this and you decide to order now, because it's worth trying out. Instant Access! … Click through & immediately start using it. Investing in your own sales effectiveness is not a "luxury spend." it's an ongoing required imperative that you're always getting BETTER at your sales job. You are either getting better, or you're getting worse. So start getting better and start seeing bigger and bigger deposits in your checking account! Try it with no risk — Easy automatic instant refund if you're not 100% satisfied. 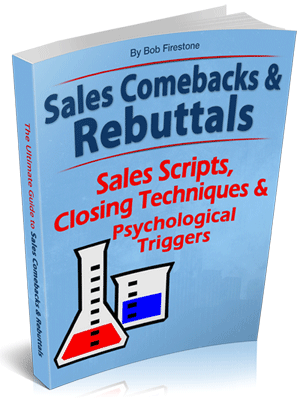 This product has sold tens of thousands of copies since 2004, and is newly updated for 2016 with 15 new pages of brand new rebuttals and modern closing techniques. You heard the sample of the Audio Training. All of our materials are produced to the highest professional standards so you can learn quickly and easily and start benefiting from your investment. My 60 day money back guarantee is automated and it's enforced by Clickbank, a neutral third party. If you are not 100% totally satisfied, simply forward your receipt to Clickbank and you will be instantly refunded — there's simply NO RISK in trying it. You have 60 days to request an instant refund for any reason, no questions asked — and you can still keep the Guide. SALESPEOPLE: THE ONLY THING YOU NEED TO KNOW ABOUT THE SAFETY OF ORDERING THIS GUIDE IS THAT IF YOU DON'T LIKE IT, SIMPLY FORWARD YOUR RECEIPT (EMAILED TO YOU WHEN YOU PURCHASE) TO CLICKBANK AND YOUR PAYMENT WILL BE INSTANTLY REFUNDED. CLICKBANK IS A NEUTRAL 3RD PARTY THAT ENFORCES THE MONEY-BACK GUARANTEE. IF YOU WANT, YOU CAN CHECK OUT THE GUIDE, AND THEN 10 MINUTES LATER ASK FOR A REFUND. I ONLY ASK YOU TO PLEASE DON'T RIP ME OFF. THIS IS MY MASTER FILE OF THE BEST SCRIPTS AND REBUTTALS I HAVE COME ACROSS, COMPILED, AND IMPROVED AFTER YEARS AND YEARS IN SALES. INVESTING IN YOUR OWN SALES EFFECTIVENESS IS NOT A "LUXURY SPEND." IT'S AN ONGOING, REQUIRED IMPERATIVE THAT YOU'RE ALWAYS GETTING BETTER AT YOUR SALES JOB. YOU ARE EITHER GETTING BETTER, OR YOU'RE GETTING WORSE. TRY SOMETHING NEW. Don't let another day go by before you take action … Do something new to increase your income! "You can't expect different or better results unless you try something new." D on't deny yourself this advantage over your buyers … Download it now. You refer to these materials over and over again. Your co-workers will beg you for a copy. You close more sales and make more cash … I promise you this, with a strong 60 day money-back guarantee. Make selling fun again! ... An investment in your own earning power is surely worth it — Try these closely-guarded scripts & open a new gateway to increasing your personal revenue. Make just one more sale because of it, and you've easily covered the cost. Try it right now because - up until 11:59pm EST on - new customers can get a 54% discount off the normal $124.95 $79.99 price and get the Complete Package including the MP3 Training and all the bonus items for only $37. "Improve Your Sales Skills, Starting Now!" Inside the Private Download Page: Once you order, you are redirected to a private download page for instant access to the Guide, the Mp3 Audio Training, and the Bonus Items — any time, day or night. Everything is encrypted for security and we do not store your credit card information after the transaction. Order with confidence: You may request an instant refund for any reason, up to sixty days after your purchase. Place your order now because the 54% Discount Offer Expires at 11:59pm EST — Congratulations on your smart decision to invest in yourself!